The businessman and philanthropist, Sidney Myer, inspired the construction of the building, after attending the Hollywood Bowl in Los Angeles. A violinist who enjoyed music, Sidney Myer established free, open-air concerts with the Melbourne Symphony Orchestra in 1929, which were always well attended by Melburnians. These free concerts continue to this day, now being held at the bowl itself. There are usually three or four concerts a year. Upon his death in 1934, the Sidney Myer Fund was established to continue the tradition of philanthropy begun by its founder. The design and construction of a music bowl for the people of Melbourne was decided upon and funded by the Sidney Myer Fund. The venue was officially opened by Prime Minister Robert Menzies on 12 February 1959, and was attended by an audience of 30,000. Later that month over 70,000 people attended to hear the American evangelist, Billy Graham. The largest crowd ever for a concert event in Australia was the 1967 Seekers homecoming concert at the Sidney Myer Music Bowl which an estimated 200,000 people attended. The 2007 Guinness Book of World Records lists it as the greatest attendance at a concert in the Southern Hemisphere in history. This attendance is also included in The Australian Book Of Records. Melburnians were celebrating the annual Moomba Festival, a free community festival, and many thousands were enjoying other attractions but are included in the crowd estimate. Since then, international performers have included: ABBA, AC/DC, Metallica, Wings, Blondie, The Beach Boys, Crowded House, Dire Straits, Neil Diamond, Bob Dylan, the Czech Philharmonic Orchestra, Merle Haggard, Pearl Jam, Electric Light Orchestra, Sir Paul McCartney, R.E.M., Dame Kiri Te Kanawa, Daft Punk, Red Hot Chili Peppers, and most recently Bon Jovi, Guns N' Roses, Soundgarden, Tool, Kanye West, Paramore, Neil Young, Lenny Kravitz, Swedish House Mafia, blink-182, The Black Keys, Lorde and The Chainsmokers. In 1980, administration of the bowl was handed over to the Victorian Arts Centre from the Sidney Myer Fund by Ken Myer, Sidney Myer's son. In 1984 a temporary ice-skating rink was created on the Bowl’s stage for use during winter months. The venue was closed for a major renovation in 2000 to bring the facilities up to an appropriate standard, and was reopened by the Premier of Victoria, Steve Bracks, at Carols by Candlelight on Christmas Eve, 2002. Recent works on the lawns extending from the seating and stage, and the construction of a fence and gates has reduced the total capacity to a little over 12,000, however, this has also improved the visibility and standard of facilities out of sight. 2009 marked the 50th anniversary of the Sidney Myer Music Bowl. To celebrate this milestone the Arts Centre put together a four-day commemorative program of free events. From Thursday 12 to Sunday 15 February, the festivities featured two concerts from the Melbourne Symphony Orchestra, including a recreation of its 1959 opening concert of the Bowl and a romantic Valentine's Day program; a salute to 50 years of rock and roll at the Bowl from RocKwiz and an afternoon picnic of family entertainment. There was also an informative exhibition in the St Kilda Road Foyer Gallery of the Arts Centre and a commemorative website depicting 50 years of the Bowl. The Bowl's canopy consists of a thin membrane made out of half an inch weather-proofed plywood sheeted on both sides with aluminium attached to a cobwebbed frame of steel cables and supported by 21.3 metres (70 ft) masts pivoted to the earth. The total area of the canopy is 4,055 square metres (43,650 sq ft). The main cable at the edge of the canopy comprises 7 ropes, each about 9 cm in diameter and 173 metres (568 ft) long, anchored deep into the ground in concrete blocks. Longitudinal cables hold up the roof and transverse cables hold it down. Project design was by Yuncken Freeman and Griffiths and Simpson during 1956. The project architect was Barry Patten. Construction commenced in 1958 with an innovative system of cables laced together and covered with aluminium faced plywood sandwich panels. To ensure the structure would be watertight yet aerodynamically stable and flexible, new construction techniques were developed. Ground anchors were required to be corrosion resistant. The shell also needed to be acoustically correct. Construction entailed input from a number of engineering and scientific organisations including the Aeronautical Research Laboratories and CSIRO Forest Products Division. Unlike the Hollywood Bowl concrete shell structure in Los Angeles which inspired it, the Sidney Myer Music Bowl combined a tensile structural system with a free-form roof. The structural design predates by nearly ten years noted German architect/engineer, Frei Otto, and his experiments in using lightweight tensile and membrane structures. Frei Otto's design of Munich's acclaimed Olympic Park for the 1972 Olympics, and the temporary West German pavilion at the 1967 World's Fair in Montreal, Quebec, Canada, were heavily influenced by Patten's design of Melbourne's Myer Music Bowl. 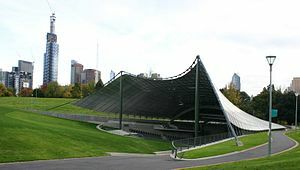 The Sidney Myer Music Bowl is registered on the Victorian Heritage list for its cultural importance to Victoria; its architectural importance as the largest, purpose built, permanent outdoor performance venue in Australia; and its engineering experimentation in new forms of construction involving use of membranes and a tensile structural system. There is a fixed seating area which can hold 2,030 people. Behind this area are sloping lawns which can accommodate up to 10,000. The stage area is 27.4 metres wide by 19.5 metres deep (90 ft × 64 ft). The Bowl holds major events including Vision Australia's Carols by Candlelight, held every year on Christmas Eve, televised each year by the Nine Network. ^ McFarlane, 'The Seekers' entry. Archived from the original Archived 9 October 2004 at the Wayback Machine on 4 June 2004. Retrieved 23 September 2011. ^ Kimball, Duncan (2002). "The Seekers". Milesago: Australasian Music and Popular Culture 1964–1975. Ice Productions. Retrieved 24 September 2011. ^ International Who's Who in Popular Music (9th ed.). London: Routledge. 2007. p. 150. ISBN 978-1-85743-417-0. ^ McWhirter, Norris; McWhirter, Ross (1968). Guinness Book of World Records. New York: Sterling Pub. Co. p. 155. ^ Nimmervoll, Ed. "The Seekers". Howlspace: The Living History of Our Music (Ed Nimmervoll). White Room Electronic Publishing Pty Ltd. Archived from the original on 27 July 2012. Retrieved 11 February 2014. ^ "Sidney Myer Music Bowl". Greatbuildings.com.